The password is dead. Long live the password! I have lost count of how many articles and blogs I have seen with regards to the weaknesses, the management, the flexibility, security, insecurity and overall usage of passwords when it comes to user authentication. We all use them and they’re not going anywhere any time soon. OK, so next step. What else can and should we be using for our user and device based authentication and login journeys? So we accept that the traditional combo of user name and passwords is bad for our (system) health. Step forward multi-factor authentication. Or 2FA. Take your pick. This generally saw the introduction of something you have in the form of a token, phone-as-a-token or some other out of band mechanism that would create a one-time-password. Traditionally the “out of band” mechanism was either an email or SMS to a preregistered address or phone number, that contained a 6 digit pass code. Internal or employee systems would often leverage a hard token – either a USB dongle or a small tag with a tiny display that would show a rotating pin. These concepts were certainly better from a security perspective, but a) were not unbreakable and b) often created a disjointed user login experience with lots on interruptions and user interaction. Where We Are Moving To – Deca-factor Authentication! OK, so user name and passwords are not great. MFA is simple, pretty cheap to implement, but means either the end user needs to carry something around (a bit 2006) or has an interrupted login journey by constantly being asked for a one-time-password. What we need is not two-factor-authentication but deca-factor-authentication! More factors. At least 10 to be precise. Increase the factors and aim to reduce the material impact of a single factor compromise whilst simultaneously reducing the number of user interrupts. These 10 factors (it could be 8, it could be 15, you get the idea) are all about introducing a broad spectrum analysis for the login journey. Each factor is must more cohesive and modular, analysing a single piece of the login journey. 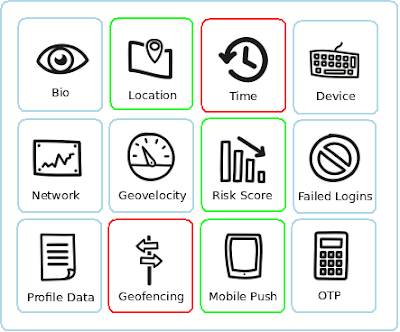 The login journey could still leverage pretty static profile related data such as a user name, but is augmented with much more context – the location, time, device origin of the request and comparison factors that look at previous login requests to determine patterns or abnormalities. 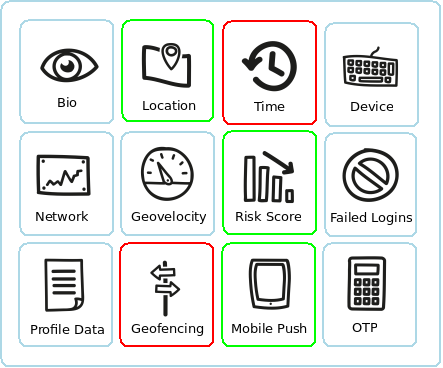 Some of these factors could “pass” and some could “fail” during the login journey, but the process is much about about accumulating and analysing risk and therefore being able to respond to high risk more accurately. Applying 2FA to every user login does not reduce risk per-se, it simply applies a blanket risk to every actor. Wouldn’t it be much better to allow login variation for genuine users who do regularly change machine, location, network and time zone? Wouldn’t it be better to give users more choice over their login journeys and provide numerous options if and when high risks scenarios do occur? Another key area I think authentication is moving towards, is that of transparency. “Frictionless”, “effortless” or “zero-effort” logins are all the buzz. If, as an end user I enrol, sacrifice the privacy regarding a device fingerprint, maybe download a OTP or push app, why can’t I just “login” without having my experience interrupted? The classic security/convenience paradox. By introducing more factors and “gluing” those factors together with processing logic, the user authentication system can be much more responsive – perhaps mimicking a state machine, designed in a non-deterministic fashion, where any given factor could have multiple outcomes. So I guess the sci-fi end goal is to just turn up at work/coffee shop/door/car/website/application (delete as applicable) and just present one selves. The service would not only “know” who you were, but also trust that it is you. A bit like the Queen. Every time you presented yourself, transparent background checks would continually evaluate every part of the interaction, looking for changes and identifying risk. Session + Bind + Usage – increasing transparency? The closest we are to that today in the web world at least, is the exchange of the authentication process for a cookie/session/tokenId/access_token. Whether that is stateless or stateful, it’s something to represent the user when they attempt to gain access to the service again. Couple that token to some kind of binding (either to a PKI key pair, or TLS session) to reduce the impact of token theft and there is some kind of repeatable access use case. However, change is all around and the token presentation, must therefore be coupled with all usage, context, resource and transaction data that the token is attempting to access, to allow the authentication machine to loop through the necessary deca-factors either individually or collectively to identify risk or change. Authentication is moving on. A more modern system must accommodate a broad spectrum when it comes to analysing who is instigating a transaction which must also be coupled with mechanisms that increase transparency and pre-identification of risk without unnecessary and obtrusive interruptions. This blog post was first published @ www.infosecprofessional.com, included here with permission. Add this blog to your feed reader.